One of the newest iPhone apps by Big Fish Games is Fairway Solitaire, a follow-up to a hugely popular iPhone app, also called Fairway Solitaire. The new version is free, requires iOS 4.0 or later, and is available as an iPad, iPod touch and iPhone app. For this review, we used an Apple iPhone 4S. Launched in 2002, Big Fish Games is now one of the leading providers of online games, and their motto is a “new game ever day!” The team specializes in relatively small and inexpensive Web games for the PC, Mac, iPhone, iPod touch and iPad. 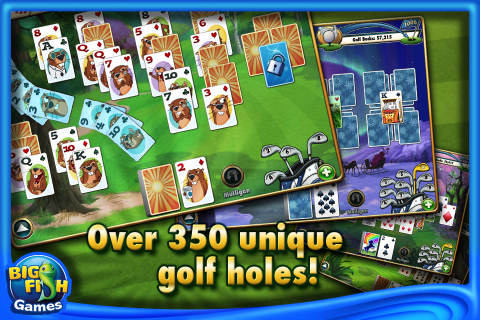 As the app name suggests, Fairway Solitaire is a golf-themed solitaire game. 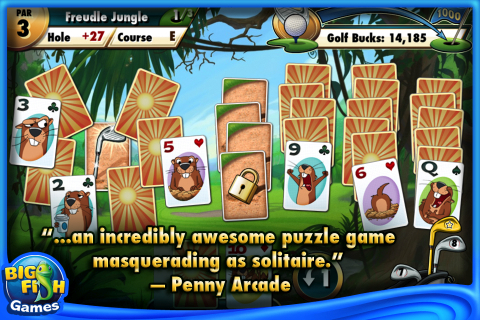 Theme-wise, Fairway Solitaire borrows heavily from the classic comedy Caddyshack: You’re just one of a long line of golfers whose had to battle mischievous gophers on the fairway. In this case, you’re battling a particular gopher: McDivot. Often, games like this are just solitaire with a little window dressing. This isn’t the case here. Fairway solitaire is actually a very unique solitaire experience. It does use one-draw solitaire as its base, but it integrates unique elements, such as courses and clubs. Each course environment is different, and clubs, which can be found or purchased, are essentially cheat cards. Upgrades are purchased with “Golf Bucks.” Golf Bucks are the in-game currency, and the player earns them by reaching achievements, finishing holes under par, holes in one and so forth. Each solitaire match is one hole, so you’ll have to complete a series of holes to finish a course. The object is to come in under par for the course, or if you’ve already done that, top your high score. What’s nice about this approach is that no one hand matters too much. If you have a terrible hand, you have at least several other opportunities to overcome it. There’s also the matter of McDivot. These types of cartoon characters are typically superfluous on an application like this. McDivot, however, is an exception. He oozes personality. He also taunts you and laughs at you, and if you’re easy to frustrate, as we are, then you’ll feel a bit like Carl Spackler in his legendary battle. We really can’t get enough of McDivot or the zany golf banter. Holes vary based on card layout, the deal, hazards and par, and with six built-in courses, there really is a lot of replay value here. Big Fish Games also offers 11 additional courses that you can add to the application by paying $0.99 via in-app purchase. You get ten of them immediately, and the eleventh is unlocked with Golf Bucks. So this setup is essentially a free trial with a $1 fee to buy. Even at $1, the bottom line of this review is that this iPhone app is well worth it if you enjoy solitaire games. AppSafari review of Fairway Solitaire – Big Fish Games was written by Darius Reimm on March 6th, 2012 and categorized under App Store, Board, Free, Games, Sports, Strategy. Page viewed 5757 times, 1 so far today. Need help on using these apps? Please read the Help Page.